One of the thing I like the most in iTunes (movie trailer download at high quality) is now gone. It was quietly removes starting 22 May to date. Trailers before 22 May can be still downloaded but Apple is pushing and pushing every time new trailer is added to the website old trailers download are being remove. 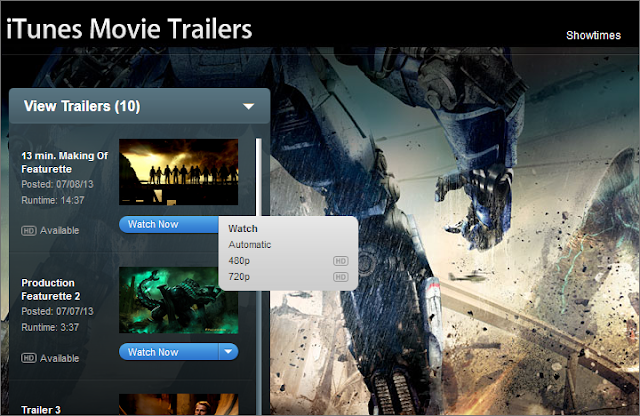 Currently, the users can only stream the trailers 480p or 720p. Compares to before that having options to download from 480p, 720p and 1080p. Some people have slow internet speed connection and it much better to download and watch them continues without having to pause/play until its done. Watch them as many times as you want. Put them on a flash drive or different devices and watch on the go. Have a local copy of your favorite movies. Can also save download bandwidth if you have limit on your data subscription. There are no words from Apple why they begun removing the option to download movie trailers.